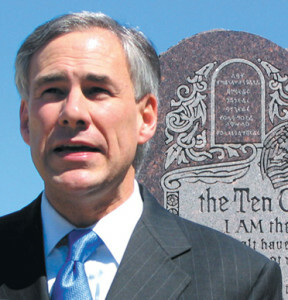 AUSTIN — Texas Attorney General and gubernatorial candidate Greg Abbott has announced the distribution of more than $46,000 in grants to over a dozen pro-life organizations in the state. The funds come from the sale of “Choose Life” plates to Texas residents, as a portion of the $30 specialty plates is set aside for pro-life purposes. According to Abbott’s office, nearly 2,300 plates have been sold, generating over $52,000 in funds. This week, over $46,000 was allotted to pro-life organizations in the state. In all, 13 organizations were approved for the grant, including Austin Life Care, Buckner Adoption and Maternity Services, Houston Pregnancy Health Center and the Gladney Center for Adoption. Currently, 29 states offer “Choose Life” plates to residents, and legal battles are being fought in two states—New York and North Carolina—over their constitutionality. As previously reported, last December, a federal judge appointed by Ronald Reagan ordered officials in North Carolina to stop producing pro-life license plates unless it also makes available plates that favor abortion. The case is now also before the 4th Circuit Court of Appeals, as the American Civil Liberties Union (ACLU) is fighting against the plates.